WHAT: A Welcome Laser Show by Manick Sorcar. followed by Q&A and book signing by both. It is the outcome of the research work of Roma Sur, a freelance writer of Highlands Ranch, Colorado who has known Sorcar almost ten years. Her research started in early 2000s while she was a student of Mass Communications and Video Production for a master's degree at the University of Denver, Colorado, where she had to do a two-minute documentary on a celebrity. She selected Manick Sorcar for his fame in animation. But when she started her research she was astounded by the magnitude of his creations in other fields. 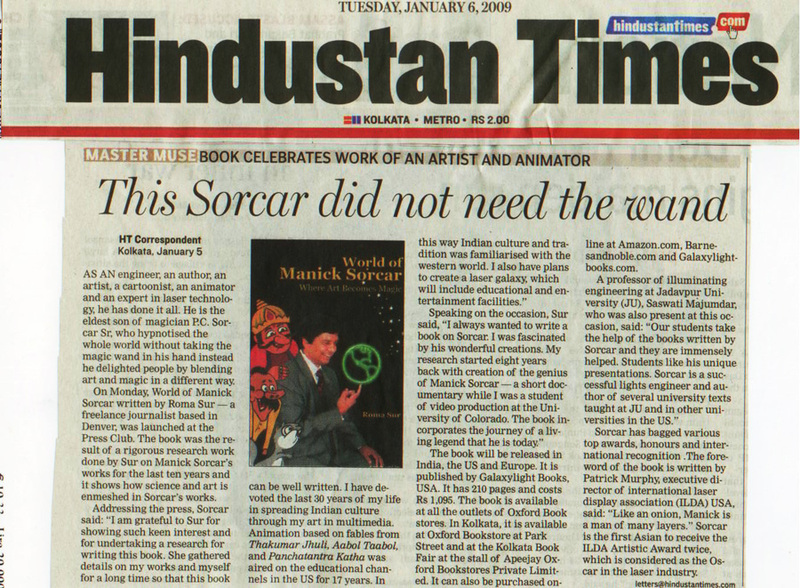 Her work, "The Genius of Manick Sorcar merely captured the tip of the iceburg of this amazing man's work", says Roma Sur, the recipient of the Graduate Student of the Year 2003, "at the time I promised that someday I would try and capture the magic of Mr. Sorcar's work and showcase it in one place". The released book is the result of her continuing research that extended almost eight years from the student days. Roma Sur is a freelance writer based in Highlands Ranch, Colorado. She has researched and scripted shows for leading national cable channels like Food Network and Home & Garden Television, USA. She has contributed articles for e-magazines and leading magazines including Denver's 5280, Los Angeles's Valley Scene Magazine, and Film India Worldwide. She is the producer and editor of an award winning documentary titled Storytelling Today. The documentary is currently being used as educational material by local libraries. She earned her master's degree in Video Production from University of Denver where she was the recipient of the 'Graduate Student of the Year' award for the year 2003. "The story of Manick Sorcar is a compelling one of versatility and triumph and represents the true entrepreneurial spirit of the West. A successful engineer by day, Manick transforms at night to become one who inspires children through animation and laser shows. When you combine those achievements with his commitment to sharing his Indian roots and bringing the East to the West, you have the formula for a fine Coloradan"
"This fascinating book is about a man who made unparallel contributions to the skyline of the City of Denver through his electrical engineering and lighting design for over three decades. Books authored by him are used at universities to contribute to the careers of students and shape the future of our nation. But that is only a small part of the amazing world of his versatile creativity. Through his art and animation, he built a cultural bridge between East and West, introducing and enriching American children with the culture of India, and making us proud by raising the flag of USA above all nations through his accomplishments in laser art and shows. I am proud that much of his accomplishments took place during the twelve years of my tenure as the Mayor of the great City of Denver. I know Manick Sorcar will continue to make our City, the Country and India full of pride." "Manick is a rare species who can blend the highest form of Technology with the highest form of Art. 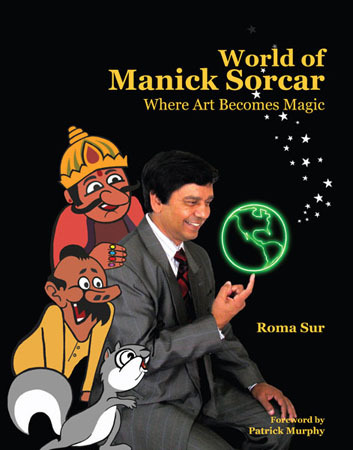 In India, very few people knew about his achievements other than the excellent 'Laser, Animation and SorcarScope' shows presented by him...But now that we have the book by Roma Sur at hand, we have a kaleidoscopic view of the different facets of the Engineer-Artist Manick Sorcar...This splendid work by Roma Sur helps to recognize the magician of Art, Manick Sorcar, eldest son of the Jadusamrat (The legendary magician P. C. Sorcar)"